Welcome to the world or rather what’s left of it, join us as we conduct a sermon for the second-hand souls and say a prayer for hope, in the belief that one day, it may return. 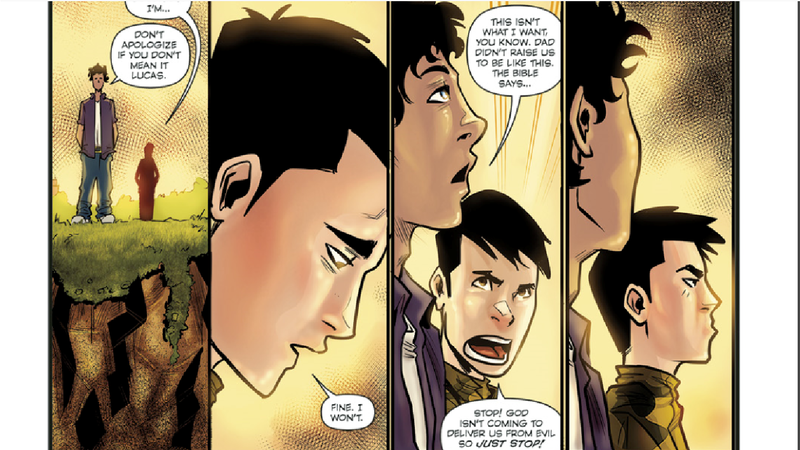 The prologue to The Wicked Righteous begins with heart-break, sadness and a wave of emotion that hits the reader like a ton of bricks from the word go. The first panel is of a sickly, gaunt and haunted looking married couple, dying from an unknown illness, clinging onto life as well as each other. The artwork in the opening frames struck me as dark and intense, a mere taste of what I was getting into. As the wife passes away the father calls his sons (who have been spared the sickness) to him and tells them, they will have to look after each other and implores them to have faith (a lot to ask of a bunch of kids if you ask me but whatever). Two years later we are given a glimpse of a city that has been ravaged by an unknown catastrophe and had its resources picked clean by human scavengers. In just a few panels we are given a sense of this world, it’s a desolate, barren, hell on earth that not even Satan himself would occupy. We are then introduced to the brothers from the prologue and they present a conflicting sense of how they will be saved from all of this. 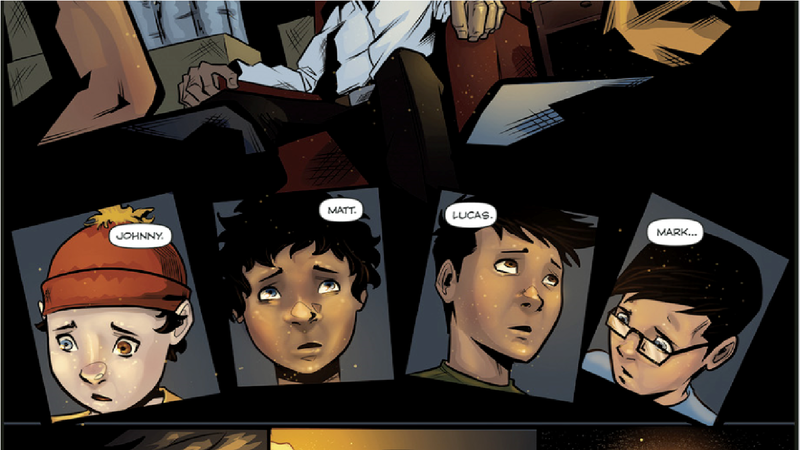 Matt, the eldest brother believes god will save them, whereas Lucas believes they are alone to fend for themselves. It gives a nice balance to the characters, as they do not mirror each other’s beliefs and it allows the reader to follow each brother on a different path to safety, if indeed that’s where the path leads. 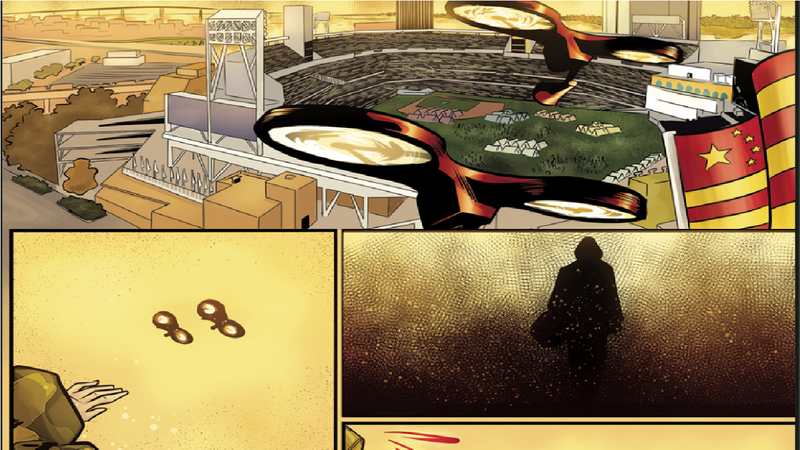 Over the next set of panels, we are treated to glimpses of the outside world, decorated beautifully with despair, painted with anguish, covered in an ever-enveloping cloud of wickedness. The artwork doesn’t simply help to tell the story, just as actions and words layer a character, the artwork guides us between dialogue and lets our mind wander. My imagination began to spark at the mere thought of what the rest of the city looked like, if there were more survivors what did they look like, were there other cities, I became invested in the story, based upon the strength of the art alone. I also found the writers use of world building to be fascinating, rather than relying solely on character dialogue or walls of text, they used my own curiosity. For example, at one point there are flying security drones that were enforcing a curfew, announcing that “unauthorised travel outside safe zones was forbidden”, it allowed the world to open up organically, and created more questions, “who’s in charge, why aren’t they safe, what has happened?” These questions were only a few but my mind had 100 different answers already. I also liked the use of the dream sequence near the beginning, a beautiful girl appears, adorned with a smile so warming, eyes that would make the stars themselves jealous and hair that flowed with grace and virtue, we spent precious few moments together in what seemed like a dreamland until…Well hello Mr Satan, come to finally join the party have you? A visit from the devil albeit short and not exactly sweet reaffirmed me that he did indeed have property in the area and I don’t mean real-estate with a pleasant view. It had me asking if it was all in the characters head, is this the biblical apocalypse or just the good old fashioned, man-made kind which has driven our character to madness. And if after a massive helping of unanswered questions, you were ready for answers, well you can sod off because after a few more escapades involving a gun fight and many bullets streaking through the torched sky, the issue ends with one man standing tall. It’s the first glimpse of this character and to say he doesn’t pack a punch would be like saying Gordon Ramsey doesn’t know how to cook and swear. While it may seem like an anticlimactic ending, I think it’s a great way to begin the series, with mystery and intrigue. A story is the canvas, our minds the brush, for we are the characters, stories and I can’t wait to see what part I play in the next edition of The Wicked Righteous.